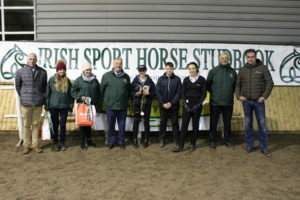 The 2019 ISH Young Breeders National Competition took place on Saturday, 26 January, at Ravensdale Equestrian Centre in Dundalk, County Louth. It was jointly organised by Teagasc and Horse Sport Ireland. Connolly's RED MILLS were delighted to support this event. Highly respected and experienced industry professionals Jack Doyle (Coach and ex international showjumper), Andrew Hughes (Ennisnag Stud), Philip Scott (Barnfield Equestrian) and Richard Sheane (Cooley Farm), not only assessed the skills of the handlers, but set the standards for their younger counterparts to match in the assessment of the horses. The day ‘doubled up’ as a forum for breeders to learn from, and interact with, the judges on the traits and requirements for the sports of show jumping and eventing, in relation to breeding stock and horses for market. A superb selection of sport horses were professionally presented by Thomas Quigley from County Carlow, providing excellent subjects for discussion. The competition itself acts as the first step in the qualification process for team participants to represent the Irish Sport Horse Studbook at the World Breeding Federation for Sport Horses (WBFSH) Young Breeders World Championship 2019 to be held in Stadl Paura Austria from the 19th to 22nd July 2019. 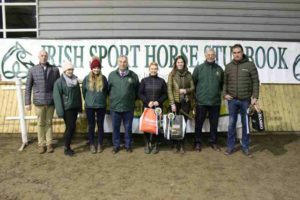 Andrew Hughes (Ennisnag Stud); Nicola Corcoran and Louise Hobbs (Horse Sport Ireland); Philip Scott (Barnfield Equestrian); Amy Finn (3rd seniors); Melissa Glynn (2nd seniors); Jack Doyle (Cruicrath Stud); Richard Sheane (Cooley Farm). 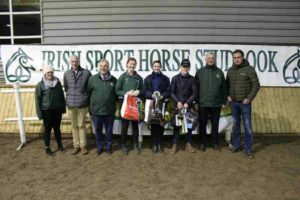 Andrew Hughes (Ennisnag Stud); Nicola Corcoran and Louise Hobbs (Horse Sport Ireland); Philip Scott (Barnfield Equestrian); Anya Teuton (1st youth); Shane Donohue (2nd Youth); Tiana Kyle (3rd Youth). The junior and senior winners will be joined by seniors Kevin Finn, Kathryn Jones, Christine O’Donnell, Sarah Brashaw, Conor Mahon and juniors Ellie Duggan, Edward Hennessy, Laura Dennehy, Katie Dinneen and Tara Timlin, to battle it out over a further four selection days in March and April. Four 16-19 year olds and four 20-25 year olds will be identified who will travel to Austria in July 2019 to represent the ISH Studbook at the International Young Breeders World Championships. The next training date for ISH Young Breeders open to all 20-25 year olds takes place at Connolly Stud Farm, Tuam, Co. Galway on 9th February where those aged 14-25 years have the opportunity to learn from established successful prize winning breeders, Pat and Shane Connolly (CSF), with the additional tutelage of Teagasc Equine Specialists and trainers Philip Scott, and Tiernan Gill, Brooklands Bedding.